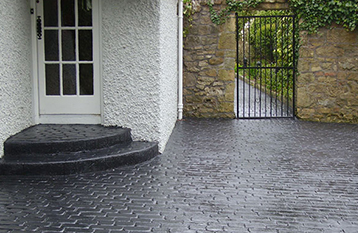 We were established in 2001 and we specialise in pattern imprinted concrete for driveways, patios and paths for both private and commercial projects. We provide a wide range of colour and design options from which you can select the most appropriate for your home. Our surveyor/installer will offer advice on design, layout and all technical aspects of the installation. Weed free and low maintenance, our driveways will not only make your life easier but will also add value to your property and enhance its appearance. In 2010, we expanded into printing walls using a special lightweight plaster that can be printed with a variety of designs with stunning finishes all in natural and authentic colours to suit any property, be it modern or traditional.